This time of year is full of joy, charm, warm, fuzzy feelings…and chaos. Let’s be honest. Who doesn’t have a love/hate relationship with the craziness of the holidays? The festive activities, the amazing food (oh, the food), the cheerful familiar songs playing (literally) everywhere, and reminders of everything we have to be thankful for will resonate with even the scroogiest among us. Yet, despite our best intentions, inevitably we can get carried away with managing our time and obligations and find ourselves feeling less than our ‘merriest.’ For those of us on the northern hemisphere, it doesn’t help that we have the cold weather to contend with. Common colds, headache, and fatigue can get the best of us. 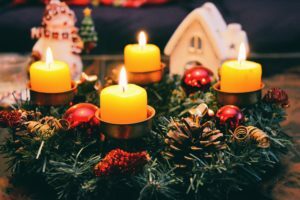 So how do we take time to take care of ourselves and stay healthy during the holidays, while still enjoying everything we love about this season? Let’s talk about it! In order to stay on top of the holiday busyness, you have to take precautions and keep yourself healthy. I know I sound like a broken record here, but folks, WASH YOUR HANDS!! Also, don’t kiss babies that aren’t yours. Actually, just avoid kids in general unless you’re personally responsible for them – ha! They’re germy little creatures, which is good because they need to build their own immune systems to be healthy adults, but we don’t need to spread that stuff everywhere. So please, use good hygiene and wash your hands. Soap. Water. 15 seconds. Just do it. Did someone say Purell? I know, easier said than done, right? Honestly though, if you know you’re going to indulge (and who isn’t, that’s part of the fun!) take it easy and eat some extra fruit that day for those vitamins and minerals, take in some extra protein (eggs, nuts, yogurt) to help keep you full, and drink plenty of water. This is so important. It’s not complicated. Your body can’t keep itself healthy unless you put the right ingredients into it – it can handle a little abuse here and there, but you have to balance it with the right stuff in order to come out unscathed. Ok, so a little fatigue during this season is normal. Be prepared for it and make sure you plan for extra sleep when you can get it. If the upcoming weekend is chock-full of parties and shopping, plan ahead and get an extra hour of sleep a few nights the week before. Also, water. Oftentimes sleepiness is a sign of dehydration. So drink up. Your body will thank you. So will those who have to go to that party with you. Tis not the season of crankiness. Seriously. Hear me out. Santa didn’t just mean those words for kids angling to score the next big Xbox system. As adults, we often find ourselves wrapped up in responsibility and forget to take care of ourselves. This includes being ‘kind’ to yourself when things get stressful. So you’re not sending Holiday cards to everyone or passing out Hanukkah presents to all? Aunt Violet will get over it. There’s always next year. You bought Christmas cookies instead of baking them? You supported a local business. Good for you. You didn’t have time to hang Christmas lights? You made your neighbors looks good. And you’re saving electricity. Good for you. The point is, do what you can and forget the rest. It’s not worth it to make yourself crazy. Remember why this season is important to you, and let that be your focus. If you have little ones in your life, you’re actually teaching them an important lesson. This season isn’t supposed to be about the material things – live out your priorities as a lesson to them. That’s something to feel good about, and it might just contribute to keeping you healthy during this holiday season. Nurse-1-1 Health Center is written by nurses in a straight to the point type of way to provide basic health information. We get a lot of people like you searching online for answers to health concerns or looking for a hotline to ask a nurse a few questions. Questions like, what are some tips for staying healthy during the holidays? How to I make sure I eat well and sleep enough to ensure I am staying healthy during the holidays? What are the main causes of sickness during the holidays? Well we can help. We put some info here for you to find while searching through all that other dry, scary medical information online. Stop that. Read our posts, or chat with us. This is not medical advice or a replacement for medical care, but see what we have to say with our free health information, and hopefully it will stop you from scaring yourself any more than you already have. We can help.